Robert Ludwinski was born in Warsaw on the 23rd of February 1980. He showed an interest in music from an early age, spending much time in front of tape recorders and radios. He could listen for hours and enjoyed recording his favourite songs. The music that he listened to was quite diverse ranging from Heavy Metal, Rock, to Pop and Italo disco. The thing that drew him to music was the melody. He enjoys listening to music with wonderful melodies that are full of energy. It was in the early 90's that Robert first came into contact with Spacesynth. He immediately took a liking to this genre of music which soon became his favourite. Towards the end of 2001 he changed to Fruity Loops and this gave birth to the project Synthesis which saw his first composition in the style of Spacesynth. It was through trial and error which saw Robert gain his own individual style as well he was able to expand on his virtual studio. Through the internet he was able to learn more about the classic artists of Spacesynth as well as getting to know new artists and labels that were producing this music. It was around 2004 when Robert decided to bring together all his material and send it as a demo for his album. In 2005 AXIS Records (now Alpha Centauri) released his debut album Synthesis - "Space Travels". In the same year he took part in Spacesynth Music Contest. The following year Robert once again took part in this contest and assumed 3rd place. The track featured on the Album Spacesynth.de Contest Trax. In 2006 saw Robert join his friend Mark Chmielewski, in creating Spacesynth music this collaboration gave birth to the project called Virtual Device. Unfortunately the lack of material has meant that the project isn't 100% complete. The beginning of 2008 saw Robert produce material for his second Synthesis Album, Virtual Device was put on hold for the moment. 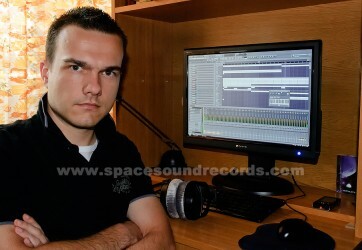 In October 2008 Robert decided to join Space Sound Records. Professionally I work in the photography field as a lab technician as well as photographer for a photographic firm. Photography apart from music is my second passion. In my spare time I take my camera and off I go, I also like making music as well as cycling. I don't have any formal music training, even in primary school I wasn't the best in music. I have always had an interest in music and liked listening to it from an early age. On many occasions while listening to various recordings I began to formalize my own ideas for my own compositions in my head. It wasn't till I bought my first PC that the road for composing was made open to me. I learnt everything on my own in the early stages using very straight forward programs like Music Maker and E-Jay, I then moved to Fruity Loops which allowed me to expand on my own ideas. As I mentioned earlier my second hobby is photography particularly landscape photography. For this reason I like to get out of town and see if I can take any spectacular scenic shots. Apart from Spacesynth I enjoy film music particularly Hans Zimmer's compositions. I also like Rock, Pop, Trance, Eurodance and Italo. My favourite artists are Dire Straits and Mark Knopfler, Mike Oldfield, Jan Hammer, Roxette, ATB, Paul Van Dyke as well as many others which we would need a lot more space for. 5 .Do you compose any other music besides spacesynth, if yes, what might that be? Apart from spacesynth I also compose Trance material as this is one of my favourite genres that I listen to. It's the changes in melody with those energetic arpeggios and those lower pads that do it for me. I found Spacesynth in the early 90's; with luck I managed to get my hands on a Laserdance cassette "Changing Times", I immediately took a liking to it. The tracks had something that I'd never heard before and I didn't know what this music was called. It wasn't long after this that I bought my first CD player and the first two CD's were Laserdance - "Technological Mind" and Koto - "From the Dawn of Time". From then on I decided to search for more music in this style and soon found the albums of Hypnosis, Ciber People, Proxyon. This is how this genre became number one for me. The thing that draws me to Spacesynth is the melody which gives the energy and the atmosphere, off course there has to be a solid foundation with that characteristic bass and those famous synth sounds. No, there's nothing in this genre that I don't like. The answers pretty straight forward Laserdance and Koto, firstly Michiel Van Der Kuy and Marco Rochowski the two stalwarts of the genre. As I mentioned previously Michel Van der Kuy who I rate for his characteristic style, arrangement and melody. Also Marco Rochowski who in his wonderful way was able to capture the essence and atmosphere of the 80's, his beautiful capture of instrument sounds and create those fabulous melodies. At the moment I am working with my good friend Mark Chmielewski on the project Virtual Device. This project is in classical Spacesynth style. Yes, I really like Italo Disco, particularly acts such as Ken Laszlo, Savage and Radiorama. With this it varies, but I think the first thing that happens is the chord arrangement, then the melody, the pads, percussion and in the end the effects. Sometimes I start with a melody but that's only when I have something playing in my head. In my opinion Spacesynth is based mainly on melody and this is the essence of this music. As it is known this is an instrumental genre therefore vocals are absent, as a result the importance of the melody becomes paramount. I think that I fit somewhere near Marco Rochowski. I really like the old spacesynth with all its classical production, sound and its links to the 80's. I try and produce music to this style. Personally I can confirm that the melody is the essence of Spacesynth. If we move away from these traditional elements and diametrically change the choice of instruments, sounds and arrangements then we can really destroy this genre. We will create a new subgenre or it will be part of an emerging subgenre. Spacesynth differs from other electronic music in its characteristics, sounds and melody. I wouldn't want to say that experimenting is not allowed or I'm against that, I myself like experimenting with sounds and melodies etc however it is important to lay true to the genre so that when one listens to it they make recognize it as spacesynth and not Trance, House or something else. In order to improve Spacesynth on the commercial market we would need to improve marketing. (Lately this has improved particularly on the Net) The larger radio stations could make a place for spacesynth thus reaching a vast audience. The equipment that I use for computer PC more specifically: Athlon X2 6000+, 4GB RAM, HDD 1TB, Sound Card Audiotrac Prodigy HD2, with regards to software that's FL Studio with synthesizers and VST effects. I believe in 100% programming synths so VST is a lot more comfortable for me than working with synth hardware. With regards to the sound of VST to hardware then it's hard to replicate the old analogue sound on software but in today's times, computers seem to allow for reasonable results, the sounds replicated are minimally different from hardware. I don't have a favourite TV show, I spend more time in front of a monitor than the TV. I would like to thank the fans for keeping spacesynth alive and that it can continue to evolve, I particularly want to thank Spacemaniak an eternal fan.